Erosion and sediment controls on construction sites minimize environmental impacts from sediment-laden stormwater runoff. Silt fence, a widely specified perimeter control practice on construction projects used to retain sediment on-site, has limited performance-based testing data. Silt fence failures and resultant sediment losses are often the result of structural failure. 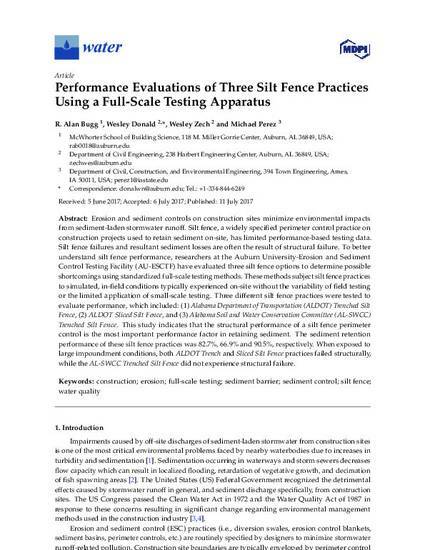 To better understand silt fence performance, researchers at the Auburn University-Erosion and Sediment Control Testing Facility (AU-ESCTF) have evaluated three silt fence options to determine possible shortcomings using standardized full-scale testing methods. These methods subject silt fence practices to simulated, in-field conditions typically experienced on-site without the variability of field testing or the limited application of small-scale testing. Three different silt fence practices were tested to evaluate performance, which included: (1) Alabama Department of Transportation (ALDOT) Trenched Silt Fence, (2) ALDOT Sliced Silt Fence, and (3) Alabama Soil and Water Conservation Committee (AL-SWCC) Trenched Silt Fence. This study indicates that the structural performance of a silt fence perimeter control is the most important performance factor in retaining sediment. The sediment retention performance of these silt fence practices was 82.7%, 66.9% and 90.5%, respectively. When exposed to large impoundment conditions, both ALDOT Trench and Sliced Silt Fence practices failed structurally, while the AL-SWCC Trenched Silt Fence did not experience structural failure. This article is published as Bugg, R. Alan, Wesley Donald, Wesley Zech, and Michael Perez. "Performance Evaluations of Three Silt Fence Practices Using a Full-Scale Testing Apparatus." Water 9, no. 7 (2017): 502. DOI: 10.3390/w9070502. Posted with permission.